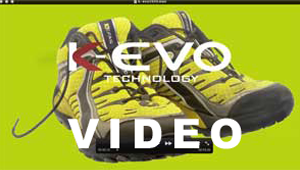 The K-EVO 3DTY sole is the evolution of Kefas footwear for sports activities, expressed with the research of new technologies. The adoption of new materials applied to the midsole, produce additional energy with less effort. This is the first kind of midsole combined with a Vibram sole, which has the following properties : the development and transfer of energy, the containment of the structure, absorption and stability. These characteristics make it suitable especially for Nordic Walking activities. The basic peculiarity of this technology is the particular division of the internal midsole into specific areas. The fusion of 3 different densities of the material allows each area to maintain its characteristics and at the same time to obtain an only form with 4 different and complementary sections for the support of the foot. The first and the second sections are respectively located in the “heel” and under the area of the “anterior metatarsal”. Here the material is very soft (SOFT) and elastic, and the feeling is to walk on the sand. The “memory” system allows the transfer of energy from the sole to the foot, which is pushed with a little effort to tackle the next step, making it also easier your walk. The bearing always return to their normal position. The third section is located under the arch of foot plantar (center), the material is hard (HARD) to obtain the function of “hardening” of the shoe-sole system in way to avoid the twisting of it, to promote an upright walk and to improve the body posture. The fourth section creates a ring of medium density (MEDIUM) along the edge of the midsole. 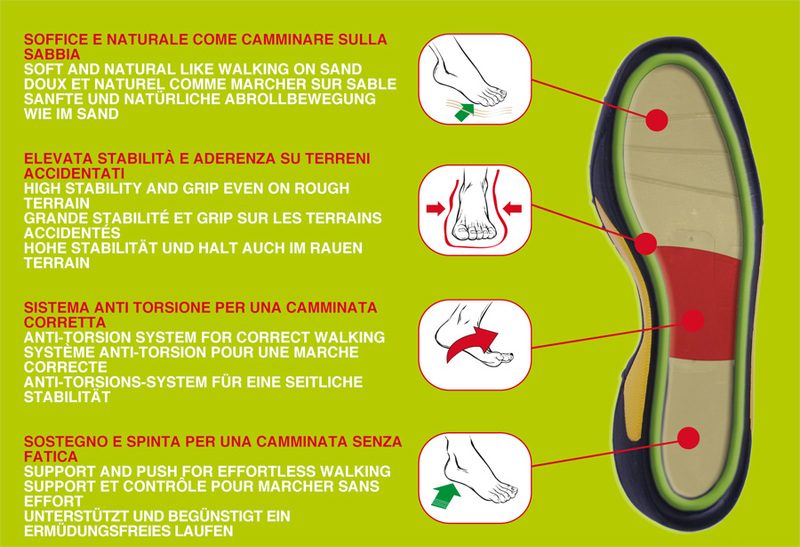 This promotes the stability of the foot inside the shoe, improving your walk and supporting also the lateral grip.